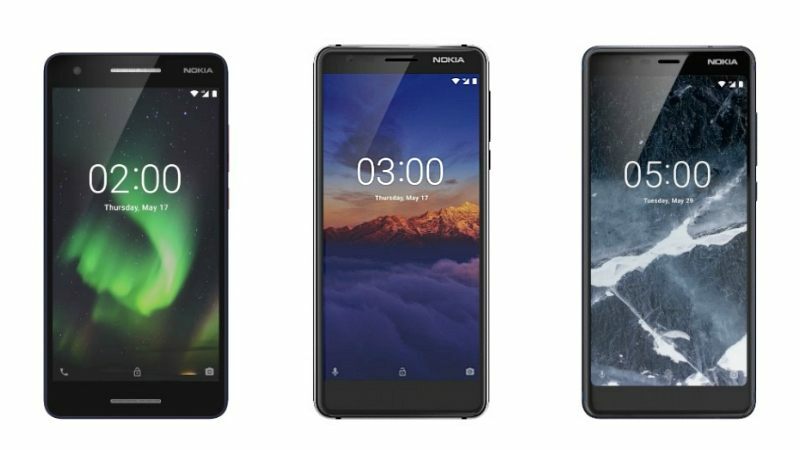 Last May, HMD Global announced Nokia 2.1, 3.1, and 5.1 and updated the range of Android smartphones. In June, we released Nokia 3.1 in India with 2 GB of RAM and 16 GB of storage. Now, in addition to Nokia 2.1 and 5.1, this brand has announced a new variant of Nokia 3.1 in India. This trio is part of Google's Android One initiative, comes with Android's stock, and offers a larger 18: 9 screen. About Nokia 2.1 Initially, this phone offers a 5.5 inch HD display and has a Qualcomm Snapdragon 425 processor. The SoC is backed up with 1 GB of RAM and has 8 GB of extensible storage. From a software point of view, the mobile phone will run Android Oreo (Go Edition). The image department has an 8 megapixel rear camera with autofocus function and 5 megapixel front shooting function for self-service. The smartphone uses a 4000 mAh battery. This should bring the battery life of 2 days. For Nokia 3.1, 2 GB RAM + 16 GB mobile phones were released in India last month, the price was 10, 499 rupees. Currently, this brand has released a high-end model with 3 GB of RAM plus 64 GB of storage. Other specifications of the mobile phone are the same as the conventional model of 5.2 inch HD + screen, MediaTek MT 6750 SoC, 13 Mega pixel rear camera, 8 Mpixel front shooting, 2 990 mAh battery. Coming from Nokia 5.1, smartphones feature all-metal monocoque designs made from a single block of 6000 series aluminum. This phone is equipped with an aspect ratio of 18: 9, full HD + resolution 5.5 inch IPS display. The screen is protected at the top with a layer of Gorilla Corning 3 glass. The handset is powered by 2 GHz OctaCore MediaTek MT 6755 S processor. This chipset has 3 GB of RAM and 32 GB of storage. This camera offers 16 megapixel rear camera with LED flash and PDAF and 8 megapixel self shooter. A 3000 mAh battery will power the package. For the price, Nokia 2.1 will be sold at Rs. 6,999, Nokia 3.1 and 5.1 will be sold at 11,999 rupees and 14,999 rupees respectively. Smart phones will be available on several domestic channels from August 12th. ICICI 's credit and debit card holders also receive a 5% discount on 3.1 and 5.1 purchases. Ideas and Vodafone subscribers will benefit from 1 GB of data / day, unlimited calls, 1 month of exciting charge offering of 100 SMS / day. Hope you like the news Nokia 2.1 And 5.1 Launched In India With 3GB RAM Variant of Nokia 3.1. Stay Tuned For More Updates!